One of the world’s most respected biotechnology entrepreneurs is being honoured at the University of Ulster in Coleraine today. 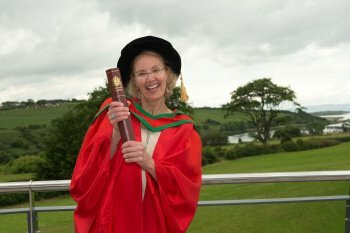 Dr Susan Whoriskey receives the honorary degree of Doctor of Science (DSc) for services to biotechnology industry and to entrepreneurship. Dr Whoriskey helped build two of Massachusetts most successful biotech companies, Cubist Pharmaceuticals and Momenta Pharmaceuticals. She is currently Senior Vice-President, Chief Technology Strategy Officer at Moderna, based in Massachusetts and also serves as a member of the Clinical Translational Research and Innovation Centre’s (C-TRIC) International Advisory Panel. C-TRIC, the award winning clinical research facility based at Altnagelvin Hospital, was developed as a joint partnership between the University of Ulster, the Western Health and Social Care Trust (Western Trust) and Derry City Council. Funding for the project was provided by ILEX urban regeneration company and Invest Northern Ireland.